A NAME YOU CAN RELY ON. We are delighted to have been presented with the Elite Premium Cosentino Honours List award this year at Raymond Blanc’s Le Manoir aux Quat’Saisons! This is a prestigious industry award that is only awarded to the ‘best of the best’ Elite Premium Studios who offer the highest level of customer service, design and loyalty when working with Cosentino materials, including Silestone, Sensa and Dekton. The Cosentino Group first began to recognise the studios that fully embrace working with the Cosentino Group in 2015. This includes loyalty to the brand, using Silestone and Dekton materials, promotions, genuine enthusiasm for the Cosentino products and outstanding customer service. 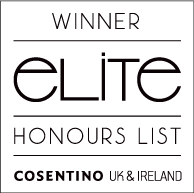 Now in its third year, out of the hundreds of brands that work with the Cosentino Group, Gideon Robinson is delighted to be awarded with the Elite Honours List! As one of the winners, we were treated to a spectacular meal at Le Manoir aux Quat’Saisons – Raymond Blanc’s two Michelin Star restaurant and hotel. We were warmly welcomed by Christophe Gontier, the Managing Director of Cosentino UK & IE before the awards were presented by internationally acclaimed Michelin star chef, John Campbell. We are absolutely thrilled to be recognised for our high standard of service and knowledge, which comes from our genuine passion for our products and quality customer service. At our studio we offer over 200 different colours and finishes, as well as an extensive range of worktops and appliances to compliment your kitchen, which we design with your wishes and lifestyle in mind. Whatever style of kitchen you are looking for, we are sure to help you Find Your Flavour.